You can add additional points to the ones already generated by the Animated Matte Generator for your source drawing. NOTEIf you have already animated the Animated Matte Generator, creating a matte point will also add that point to every keyframe. Therefore, you will have to position that point on every keyframe of your animation to make sure it looks and moves as expected. In the Node or Timeline view, select the Animated Matte Generator node. In the Camera view toolbar, click on Show Control . From the top menu, select View > Show > Control. The control points for the Animated Matte Generator display in the Camera view. In the Editing Mode panel of the Animated Matte Generator view, select Add Matte Point . NOTEContrary to tools like the Contour Editor, you cannot use a keyboard shortcut to click and add a point to a matte contour. In the Camera view, click on the matte contour where you want the new point to be created. 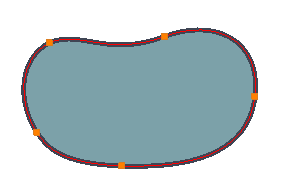 Adding a matte point to one of the matter's contours will also add a point to the matte's other contour. It is not possible to have a different amount of points on a matte's inner and outer contours.